I strongly commend to our readers’ attention this excellent talk delivered to the recent Colloquium of the Church Music Association of America by Dom Benedict Maria Andersen OSB, a monk of Silverstream Priory in Ireland. 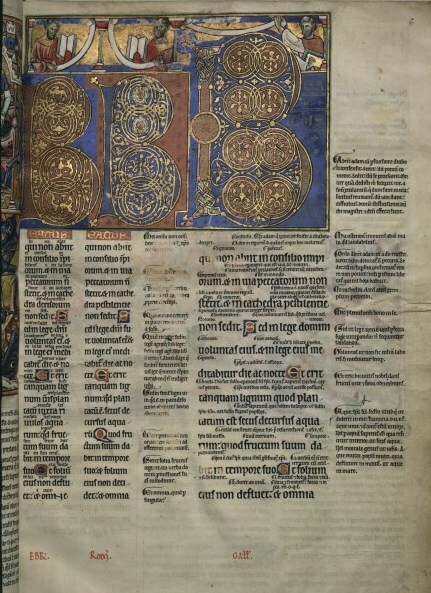 It is entitled “Fulfilled is all that David told”: Recovering the Christian Psalter; by “Christian”, Dom Andersen here means the Psalms according to the Septuagint translation, which was used in the New Testament itself, and received by the Church from the very beginning for liturgical use. He offers a particularly interesting discussion of the importance of certain readings of the Septuagint for Christian theology and liturgy, also noting how the modern presumption in favor of the later Hebrew Massoretic text has led to a significant (and largely unjustified) break with tradition in the recasting of many liturgical texts for use in the Ordinary Form. h/t to Mr Brian McCord! 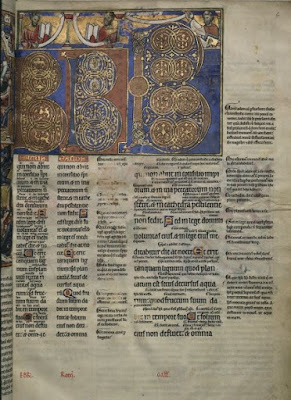 The first page of a Psalterium Triplex, with the three versions of the Latin Psalms in parallel columns, plus glosses and commentaries. Paris BNF Ms. Latin 8846, ca. 1190.